Larraine is a seasoned senior executive with general management experience, and a world renowned level of expertise in the creation, implementation and management of complex business alliances in multiple industries including healthcare, technology, consumer products, manufacturing, aerospace, financial services and more. She has startup and turnaround experience, and a strong track record for speedy and innovative problem solving, enabling buy-in for complex change management and cultural change. Larraine Segil is currently the Chair and CEO of the Exceptional Women Awardees Foundation, aimed at changing women’s lives through a proprietary, metrics-based mentoring program. The program selects mid-career women from multiple industries and provides mentorship, guidance, and career redesign advice to propel them to sustainable success, known as the Exceptional Women Awardees (EWA). Ms. Segil also runs a family-held, small urban farm company called the Little Farm Company and holds an adjunct professor position at Southwestern Law School and Pepperdine School of Law Straus Center for Conflict Resolution. She served on Frontier Communications’ board and presently holds board member positions at Kandela Inc. (Chairman), Vanir Construction Management (Audit and Nom), NACD Southern California section (Chair Nom/Gov), and APCO Worldwide. Larraine’s previous accomplishments include Partner Emeritus and former owner and director of Vantage Partners LLC, member of UNICEF’s Tropical Diseases Special Advisory Group on Alliances (SAAG), global alliance educator for 30 years in the Americas, Europe, United Kingdom, China, and Singapore, and practiced immigration, litigation and corporate law as a licensed attorney. Larraine holds a BA, BA Honors in Classics, Juris Doctorate from Southwestern School of Law, and an MBA degree from the Presidential Key Executive MBA program at Pepperdine Graziadio Business School. Ms. Segil is a member of the Board of Frontier Communications (NYSE: FTR) in Stamford CT., a Fortune 300 company where she sits on Nominating and Governance, Compensation and Audit Committees. Ms. Segil is Partner Emeritus and was formerly owner and director of Vantage Partners, a privately held consulting firm with expertise in building competency in both internal and external relationship management which acquired her firm, The Lared Group in 2003. Vantage Partners evolved out of the Harvard Project on Negotiation. Its partner/directors have authored many books including “Getting to Yes” and “Difficult Conversations”. Segil has served Global 100 and Fortune 500 companies assisting them to create and manage their critical business relationships with suppliers, customers, alliances, joint ventures or channel partners. Ms. Segil is a senior research fellow at the IC2 Institute at the University of Texas, Austin as well as on the Entrepreneurs Board for the UCLA Anderson School of Management. Larraine sits on the Advisory Board of Edgecast, a Content Delivery Network Company (CDN). She sat on the board of The Los Angeles Regional Technology Alliances (LARTA) representing 35,000 Southern California early stage technology companies for 16 years, and has been recognized by The Financial Times Knowledge Dialogue Group and The Corporate Strategy Board as a thought leader in alliances. Ms. Segil has served on the Governing Board and now on the Foundation Board of The Committee of 200, a global nonprofit group of Women CEOs and on the Board of Governors of Cedars Sinai Medical Center. For the past 24 years she has taught executive education at The California Institute of Technology, (Caltech), Pasadena CA, where she has presented a two day program on Global Alliances. She is an Adjunct Assistant Professor of Law at Southwestern Law School, Los Angeles on the topic of The Business of Strategic Alliances. In January 2009 she was appointed to the UNICEF/UNDP/World Bank/World Health Organization (WHO) Tropical Diseases Special Advisory Group on Alliances (SAAG) in Geneva, Switzerland. She serves on the board of the National Association of Corporate Directors (NACD) Southern California section. Born in South Africa, Ms. Segil immigrated to the USA in 1974. She was formerly CEO of an advanced materials company providing products and services to aerospace and electronics manufacturers worldwide. She co-founded a California Thrift and Loan Company as well as a series of free standing ambulatory care clinics providing medical services, and previously practiced international corporate law. Ms. Segil is a regular commentator for CNN and CNBC and presents keynotes on domestic and global alliances, mergers, and critical customer supplier, channel, and outsourcing relationships. Ms. Segil is the author of numerous books, including: Intelligent Business Alliances, Fast Alliances: Power Your E-Business, Dynamic Leader, Adaptive Organization: Ten Essential Traits for Managers, and Partnering –The New Face of Leadership. Her latest book, Measuring the Value of Partnering, is the first on Alliance Metrics. She authored a novel, ‘Belonging’, published by Penguin Books and is presently running a family-held, small agricultural holding company, Little Farm Company, and has written two E-Cookbooks. She is also a composer of music and lyrics and has two children’s CD’s and a CD of adult songs launching 2011 under the label ROCKIN’ GRANDMA (www.rockingrandmamusic.com). Larraine has created two endowment funds for scholarships for women managers in strategic alliances – one at the joint JDMBA program at the Peter Drucker School of Management and Southwestern School of Law, and the other for Pepperdine Business School Presidential Key Executive MBA Program. Ms. Segil holds BA Honors in Latin and Classics, JD and MBA degrees. She is a member of Hillcrest Country Club and The Jonathan Club, Los Angeles. 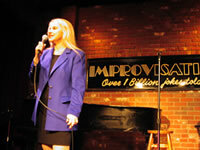 Larraine Segil, LIVE AT THE IMPROV on February 24 2002 as a standup comic in order to prove that anyone can learn to be funny… – great reviews! The Civil service College , Singapore and the Greenleaf Centre for Servant leadesrhip, Asia are co organising a Conference for 7th Creating Great Places to Work Conference in Singapore from 17 – 18 April 2012 . The theme of the Conference is ” Building Collaborative Communities . I am writing to invite you to be a plenary speaker and as paneillist for the closing dialogue , In addition , we will like to invite you to conduct a concurrent workshopof 3 hours duratin at the Conference. This Conference brings international thought leades and practitioners to show the ” how : of building collaborative communities . It will be our privilege to have you at our Conference. pl contact me at my email & I will be happy to address any queries you may have.